Fact: an ‘accommodation,’ ‘deal’ had been reached on Friday night between the DUP and Sinn Fein. The British and Irish governments genuinely believed a structure had been worked out by Sinn Fein and the DUP as a basis for the restoration of an Executive and Assembly. The key DUP/Sinn Fein negotiators I am advised, had moved beyond discussion on the ‘accommodation’ and were at that stage addressing details about the restoration of an Executive and Assembly. Draft legislation had already been in place to facilitate three bills aimed at realising three Acts which would embrace a free standing Irish Language Act, a free standing Ulster Scots Act and a Cultural Act which would reflect DUP concerns about what they see as their ‘Britishness.’ All these acts would be ‘freestanding’ or independent of each other. A key non party insider familiar with the workings of government bills and acts told this website “an Act can reference another Act without impacting on that act.” Each Act, in other words, would protect its own integrity. Both talks participants made it clear they would have to brief and seek the approval of their bases. In terms of the DUP negotiating team – that involved six members including Simon Hamilton who along with Gregory Campbell have been dancing upon a pin head about Sinn Féin’s declaration of an ‘accommodation’ having been reached. My insider is categoric that an ‘accord’ ‘accommodation’ had been achieved by Friday night. Furthermore the governments marvelled at the intensity and genuineness of the commitment of the respective party negotiating representatives. I’ve been probing the DUP to try to establish what prompted Arlene Foster to make the dramatic announcement on Wednesday that the Talks had collapsed. I am told DUP MLAs were jumped by the announcement that PMs Theresa May and Leo Varadkar were arriving in Northern Ireland on Monday. Secondly, Unionists were said to be startled by news headlines awash with speculation about a deal including a free standing Irish Language Act. DUP and unionist constituents now believed a deal had been done over their heads and an avalanche of concern enveloped DUP MLAs and MPS with reports of Unionists who ‘loaned’ their votes to DUP members in the last election being told, not to appear at their doors should they agree to a free standing Irish Language Act. 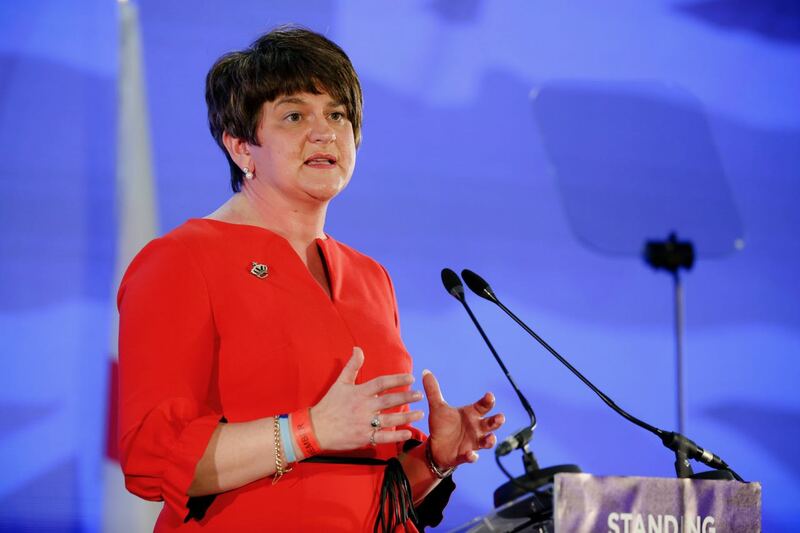 Arlene Foster referred to the presence of the PMs as a “distraction.” She had in mind the reaction and fears among her constituents that a deal was being sealed above their heads. A government insider told me it is inconceivable that the PM was coming to Stormont without knowing that there was a basis for an agreement. The tsunami of Unionist grassroots’ reaction to the arrival of the PMs and reports of a free standing Irish Language Act stirred the horses. Such was the shock reaction inside the DUP’s six strong team to grassroots concerns that the negotiators and the party’s ten strong Officers’ group did not reveal the contents of the ‘accommodation’ to their Assembly members on Monday morning. That information was withheld – not shared. Journalists ought to listen carefully and read between the lines of what Simon Hamilton and Gregory Campbell have been saying. They have direct access to what was going on at the talks table. Sinn Fein spokespersons like Conor Murphy and Michelle O Neill are unambiguous about the package that was on the table. My Stormont insider who has had a bird’s eye view of processes at work down the years is unambiguous about the shape of the final package that was on the table. The Unionist people have shown their politicians their teeth. February 15, 2018 in News & Current Affairs. Unionism Lemming attributes are very much to the fore. They will never learn and UK PM May has now been embarrassed by DUP twice. The Ides of March are upon the Putrid State. The DUP have so much more current power than any other political party in Northern Ireland and will continue to do so until the next General Election. They’ll continue to play a role in UK policy and may continue to block the NI Assembly. As we prepare to leave the EU and its corridors of power, we will lose these useful mechanisms which could also provide stability and a way forward for solutions to the age old Irish Question. Our options are now decreasing by the day. The Europeans must be laughing at Theresa May with the DUP tail now wagging the UK dog. The EU, like it or hate it, has provided stability in the war torn continent of Europe since 1945 – 73 years of peace – and now Europe could start to wobble because the UK wants to throw its dummy out of the pram. What on earth did all those British servicemen suffer and die for facing the Nazis in World War Two? This real peace in Europe is all being undermined by the Tories under the pretext of a better Britain. Who are they kidding? Jim the Soldiers Sailors and Airmen did not die for a EU Superstate if the peace in Europe is undermined by the UK leaving the EU then there was’nt much peace in the EU to start with .dont you think ? I think you will find the referendum questions was open to everyone in the UK. It was the majority of people living in the UK that voted to leave the EU not the Conservative (Tory) government. Shadowy figures behind the scenes spooked the DUP. That’s why there is no agreement. The basic fact is that the DUP has sought, with its ‘supporters’ to undermine the GFA – since its inception. It took longer than they expected because of the persistence of Martin McGuinness. His death gave the DUP and its ‘supporters’ the opportunity they needed. Now they’ve succeeded. The GFA is dead and this little statelet is in limbo. Superb analysis! The DUP from day 1 wanted to destroy the GFA and T.May gave them the chance. The only hope for nationalism now is the Dublin government standing up for them and the GFA. They have the perfect carrot/stick with Brexit and the EU behind them. We are definitely in the endgame for NI. This period in 100 years from now will be looked on akin to the disruption of 1916-1921. Unionism it would appear does indeed see this place as exclusively British and do not want to share this land! Sin é.
What’s noteworthy is that the British – the inhabitants of Britain – don’t see this place as ‘british’. They see this place as part of an Irish scenario. All sides want to be paid (handsomely) for not doing any work so this suits them- they don’t care that ordinary people will be harmed by their actions. Incredible how Martin McGuinness held this country together. I never thought hindsight would show me this. Eamonn please tell me how an Act can be made legal at Stormont. Any free standing Act would have to be voted on in Westminster and since SF do not attend Westminster, how on earth could these be made laws. They were to be acts of the Northern Ireland Assembly which passes its own legislation, not Westminster. Sick to death of SINN Fein wanting Irish language act..when half the people don’t even speak it ffs and for signes to be put up..sorry I’m n.irish and I’m part of the UK..stop blaming the DUP ..for heaven sake you won’t even take your seats in parliament lol so should not get paid for it..
Janet maybe you should try writing in Irish as your English spelling is atrocious. Janet don’t you think that the Irish language and associated culture is something worth saving? Legislation of this nature will not affect NIs status as part of the UK. It would however show NI Nationalists that Unionism is at last prepared to reach an accomodation on equality of the two traditions here. 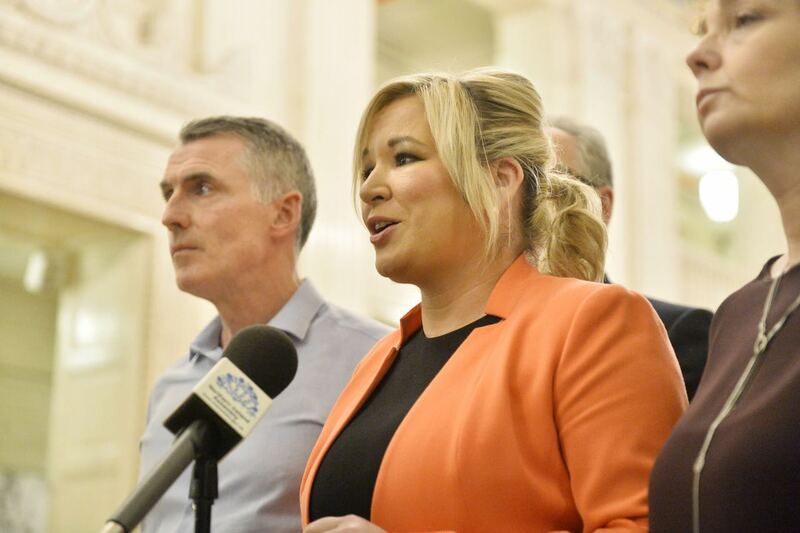 Not yet though it would seem, there will be Unionist dominance for another while yet….. where compromise is not forthcoming change will be imposed in future years. History has taught us that! Unionism has cut off its nose to spite its face. It will only galvanise an increasing Nationalist electorate to vote for SF there by hastening the demise of the Union. Says it all about Unionism when they see Equality as a concession. Another political party running scared of their activists. Despite the fact that committed party members are a dwindling proportion of the electorate as a whole (with the exception of Corbyn’s Labour), it is remarkable how much sway they hold over their ‘leaders’. As an interested observer from Scotland can I say I find the actions of the DUP confusing and contradictory to say the least. They keep screaming that they want to be as British as the rest of the UK,except when it comes to protecting the Irish language in a similar manner to the law the Welsh have protecting Welsh or us Scots have protecting Gaelic. Unionists are great democrats but only when it suits them.They defied the will of the Irish people in 1921 by taking up arms. If they are voted down at a forthcoming NI election, do nationalists really believe they will just roll over an accept a new Irish dispensation? My guess is that they will attempt initially to gerrymander a majority by ceding Newry, and L’Derry east of the Foyle, bits and pieces of Armagh, Fermanagh and Tyrone. How exactly they would gerrymander Belfast would be a problem though – a greenish Berlin marooned in a sea of Unionism. The issue of Ireland has now become a European problem. It is doubtful that the british will be able to make a deal that satisfies the EU and, therefore, they will most probably crash out of the EU altogether. Under this scenario the EU will rightfully take measures to protect itself and its citizens living in the UK which will include all Irish/EU passport holders living in the six counties. It is very likely the EU will place high tariffs on all goods entering the EU from the UK, and the EU will also make representations to the IMF to have the UK credit rating reduced because of the large outstanding debt (50 billion euros?) the UK owes to the EU. This will make it more expensive for UK banks to borrow money which will push inflation up causing prices across all economic sectors to rise dramatically. It is also quite probable that the EU will make representations to the UN in order to place the UK under international pressure to safeguard EU citizen rights living in the UK. This pressure could lead to ecoonmic sanctions if the UK fails to give legal assurances under agreed UK/EU legislation. The result of all of this economic pressure will cause the UK economy to tank leading to a catastrophic recession which will cause widespread civil unrest. Under this likely scenario the finger of blame will not only be pointed at the tory government but also at the dup and the Act of Union as the UK crumbles before the eyes of its population.